All ATV registrations expire June 30. 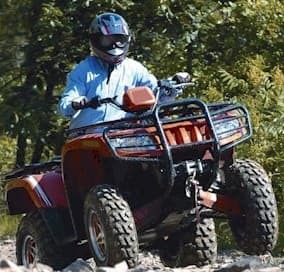 Maine residents may renew an ATV registration online. New registrations must be done through a registration agent or the MDIFW main office in Augusta. Nonresidents may register or renew an ATV registration online. This online service allows you to register your ATV with the State of Maine. Following your transaction, you will receive a confirmation page to print for immediate use. Your official registration and stickers will arrive at the shipping address specified within thirty days. Registrations may also be obtained from some licensing agents or by mail. For registration period starting July 1, the registration fee will be $34* for a resident, $54.00 for a nonresident 7-day, and $69* for a nonresident season. New registrations only - Beginning May 1st of each year, registrations will be valid from the date of issue through June 30 of the following year. Proof of payment of sales tax required on first time registrations or proof of prior registration (Maine residents only).